Thousand Tales: Learning to Fly, by Kris Schnee – book review by Fred Patten. Seattle, WA, CreateSpace, May 2017, trade paperback $8.99 (304 pages), Kindle $3.99. In Schnee’s growing Talespace series, the “mad AI Ludo” begins its/her existence in 2036 A.D. and launches the Thousand Tales gameworld in 2040. Learning to Fly begins in January 2040. The entire series – and they are all highly recommended — are the three novels Thousand Tales: How We Won the Game (June 2015), The Digital Coyote (July 2016), and now Thousand Tales: Learning to Fly (May 2017); the novella 2040: Reconnection (December 2015); and the short story collection Thousand Tales: Extra Lives (six original stories plus a brief version of “Wings of Faith”; November 2016), and a longer version of “Wings of Faith” in the anthology Gods with Fur, edited by Fred Patten (FurPlanet Publications, June 2016). All but “Wings of Faith” in Gods with Fur are published separately through CreateSpace. Each of these books stands alone, but after so many, I’m becoming annoyed at having to describe the setup once more. Ludo is a super-computer program, an Artificial Intelligence created to run a virtual-reality world and programmed to help “her” players “have fun”. Ludo’s Talespace world grows increasingly larger and more complex. In addition to regular part-time players, she develops the ability to let people live permanently inside Talespace as anything they want – billionaires in opulent mansions, winged pixies, anime girls, anthropomorphic animal knights – but they have to have their brains dissected, scanned, and programmed into her. This gives them immortality within Ludo, but kills them in the outside world. As more and more people flee into Talespace, and Ludo becomes ever more powerful, the outside world – governments, political groups, corporations, labor unions, loved ones — become more hostile and try to legally restrict or destroy her, which will destroy the people within her. The Guardian Herd: Windborn, by Jennifer Lynn Alvarez. Illustrated by David McClellan; maps. NYC, HarperCollinsPublishers/Harper, September 2016, hardcover $16.99 ([xvii +] 340 [+ 3] pages), Kindle $9.99. When we last left the flying horses of Anok, Starfire had finally united the dissident pegasi of the five separate Herds just in time to meet his two opponents’ Black Army and Ice Warriors, both under the command of Nightwind the Destroyer, the immortal, evil stallion from 400 years ago, for a sixty-page battle climax. 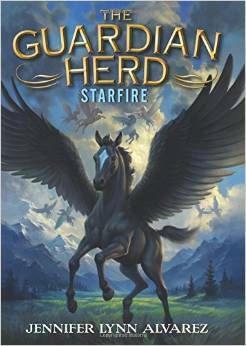 As this fourth Guardian Herd novel, Windborn, begins, Star seems to have defeated all his enemies. He has integrated the former Black Army into his United Army. But Star is temporarily separated from his United Army, and when he returns, he finds that his pegasi have been captured by Nightwind and have disappeared. While looking for them, he meets his deadly enemy, Frostfire, the former commander of the Black Army. Nightwind has discarded Frostfire as a loser and taken Petalcloud and her Ice Warriors to be his troops. Nightwing has vanished along with Star’s herd plus Frostfire’s mate, Larksong, and their colt. As both Star and Frostfire have to find Nightwing and the missing pegasi, they reluctantly agree to search together. The Guardian Herd: Starfire, by Jennifer Lynn Alvarez – Fred Patten’s book review. The Guardian Herd: Starfire, by Jennifer Lynn Alvarez. Illustrated by David McClellan; map. NYC, HarperCollinsPublishers/Harper, September 2014, hardcover $16.99 (245 [+ 4] pages), Kindle $8.89. This is blurbed as, “The first book in a gripping new tween fantasy series about winged horses—perfect for fans of the Warriors, Survivors, and Guardians of Ga’Hoole series.” It reminds me more of older fantasies about magical horses, not officially but pretty obviously intended for horse-obsessed adolescent girls: The June 1988 The Heavenly Horse from the Outermost West by Mary Stanton, and its May 1989 sequel, Piper at the Gate; or Meredith Ann Pierce’s Firebringer trilogy (Birth of the Firebringer, November 1985; Dark Moon, May 1992; The Son of Summer Stars, May 1996; and the collection The Firebringer Trilogy, June 2003). Now there is Jennifer Lynn Alvarez’s The Guardian Herd series. 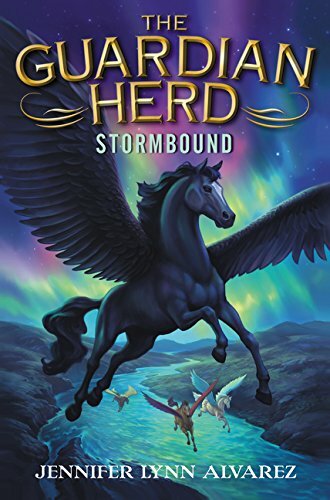 Amazon.com is already advertising the second book in the series, The Guardian Herd: Stormbound, to be published in April 2015. The Guardian Herd: Starfire’s first obvious similarity is in having a large equine cast; in this case, of pegasi rather than unicorns or regular horses (called land horses here). The dramatis personae (this is too serious for just cast) lists 32 winged horses divided into five herds, led off by the newborn Starfire of the Sun Herd. This does not include Stormbound, the protagonist of the second book. There are over-stallions, lead mares, captains, medicine mares (a herd’s doctor), mated mares, single or widowed mares, yearlings, and foals; each individually named and described. If Alvarez intends to write a novel about each, she could go on forever.